In honor of September being Childhood Cancer Awareness Month, I'm so excited to introduce you to Kylie. I received an e-mail from Kylie telling me all about a charity, The Elle Foundation, started by a friend and her family. Let me just tell you...Kylie is passionate about this and it totally came through in her e-mail. Today Kylie is going to share with you about this awesome foundation that grants second wishes to children with terminal illnesses. For example there was a little boy that had a pool donated to his family through Make-A-Wish, but a week before the pool was finished, he had to have a trachea put in. Therefore, he wasn't able to even use his new pool. The Elle Foundation gave him the opportunity to ask for another wish! There are so many other stories like that and it's amazing what this foundation does! In 2003 a young girl, Lauren Richmond, was diagnosed with a very rare and tenacious chordoma tumor on her brainstem. For over five years, with strength and determination, Lauren underwent various procedures to rid herself of the tumors. Unfortunately at the age of 15, Lauren lost her battle to cancer. Lauren knew that a recurrence of cancer is sometimes more devastating than an initial diagnosis, because you start to lose hope. You start to wonder what you did wrong to deserve this. In Lauren’s finals days, she wrote “ I am up to you” and charged her family to take care of her foundation. She wanted to grant second wishes to children who had a recurrence of cancer. There are thousands of foundations that grant children a first wish, but this is one of the ONLY foundations that grants children a second wish. After establishing the ELLE FOUNDATION Lauren’s mom, Laurie, made a decision to quit her career and devote all of her time to the foundation. She does not accept any salary and all profits go towards wish granting. 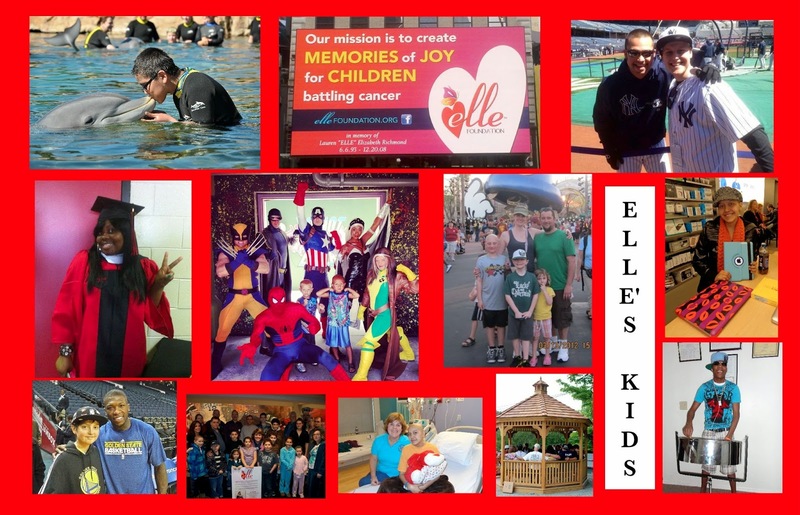 Over the years, the foundation has sent ELLE children to Disney World, professional baseball games, given them ipads, paid for their families to go on a vacation, etc. The ELLE FOUNDATION’s goal is to create memories for those families that have a child that is struggling with this terrible disease. The foundation not only helps create memories, but it also offers support to the families facing these difficult situations. Unfortunately, due to so many wish applications and not enough funds, the foundation sometimes is not able to grant the type of wish a child wants. Our goal is to one day be able to accept every child’s wish application and help make memories and dreams come true. If you would like to make a donation to this foundation, please visit www.ellefoundation.org and click on the donate tab. Thank you all very much for your support and donations. Kylie....thank you SO much for sharing this with us today. Praying for all those kiddos and their families involved with the Elle Foundation. What a special foundation! I'm so glad you did this post :). I can't thank you enough for doing this! This post was wonderful! Thank you! What a wonderful foundation! Thanks so much for sharing! I appreciate your post today so very much! I lost my one year nephew to cancer in April. It's such a devastating disease and any awareness people can bring to it is awesome!!! On the fifth day of each month, my sister has asked that we perform some act of kindness in Mason's memory (his birthday was on the fifth). Next month on the fifth I will be donating to he Elle Foundation...thank you! Oh my heart! So heart breaking to think of what these kids go thru, but how wonderful this organization exists!!! Sounds like a great organization, so glad that this is here to help.